But ultimately, any sort of manual video categorization process would take huge amounts of time and resources. Introducing Cloudinary's Automatic Video Tagging add-on, powered by Google Cloud Video Intelligence, which is now fully integrated into Cloudinary's video management and delivery pipeline. 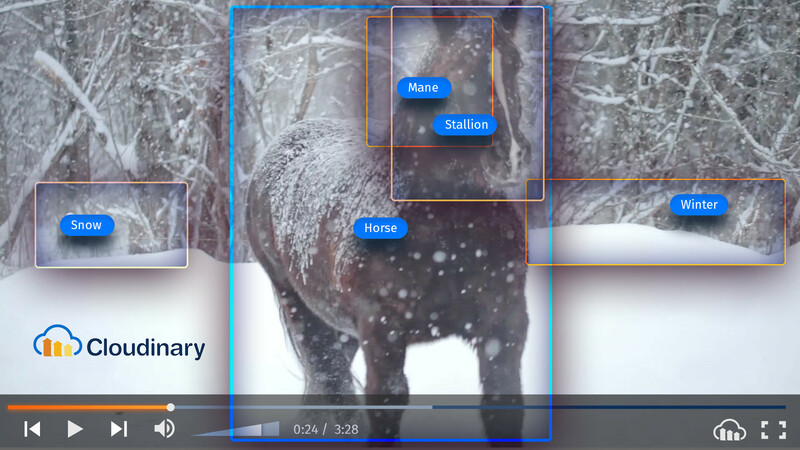 State-of-the-art machine learning allows for the recognition of various visual objects and concepts in videos, simplifying and automating the categorization and tagging process. Once the categorization process completes, the information is returned to Cloudinary and all categories that exceed your specified confidence score are automatically added as tags on your video. As can be seen in the example snippet above, various categories were automatically detected in the uploaded video and automatically added as tags. Each category is listed together with the start and end times of the relevant video segment (an offset time of -1 means the category represents the entire video) and the confidence score of the detected category, where 1.0 means 100% confidence. Once the video has been categorized, that information can be shared with your analytics tools. Cross-examining both the categorization and usage data can yield valuable insights into how different videos impact engagement and conversion. 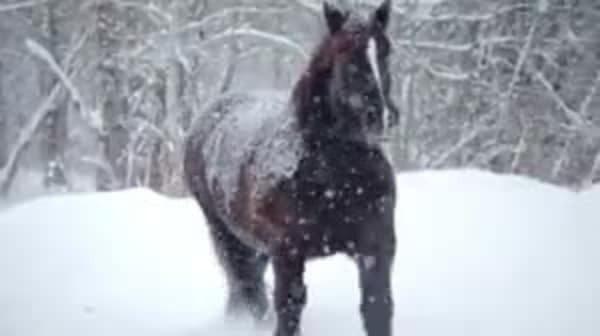 Do the videos show indoor or outdoor scenes? Do they include people? Animals? This information can then be leveraged for AB testing and user profiling. For example, you can test how different videos, (e.g., with or without animals) may impact engagement for a specific product or service, helping you utilize the optimal content when designing websites, apps or email campaigns. You may determine that a user watching videos of parties, events, sports, and music is probably a college student or young adult, whereas a user that uploads videos of parks, children, and playgrounds is more likely to be a parent. This knowledge can help you focus your content on the right audience and increase engagement and conversion. Additionally, a well indexed, organized library of videos can be leveraged across your entire organization. Tagging is particularly useful if your company has a constantly growing library of digital assets that need to be made available for various teams within your organization. For example, if the marketing team needs a video of a dog for an email campaign, they can search for and select the most appropriate video. 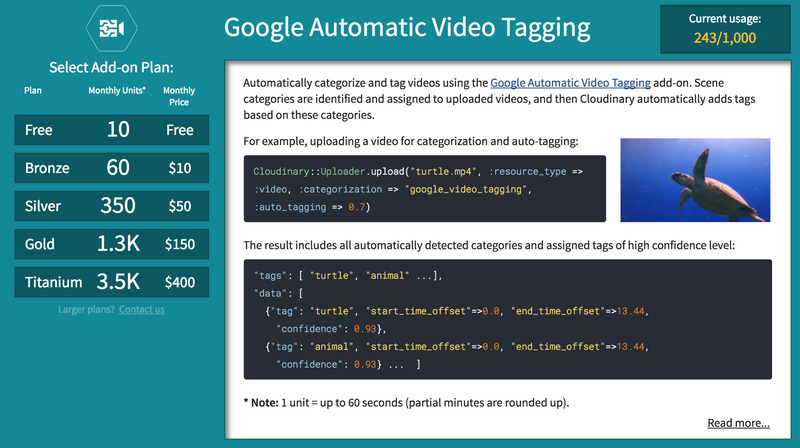 See automatic tagging in action Visit Cloudinary's Video Transcoding demo where you can check out the results of the automatic tagging add-on for a number of sample videos or even upload your own. You can also see examples of a variety of advanced video transformations as well as a demonstration of the Video Transcription add-on. The Google-powered Automatic Video Tagging add-on provides you with meaningful data extracted from videos. Take advantage of that data to make strategic business decisions that could improve your users’ experience and drive greater profits. Cloudinary’s service, together with the fully integrated Automatic Video Tagging add-on, provides you with the powerful ability to streamline your content management as well as increase your users’ engagement and conversion. The add-on is available with all Cloudinary plans and offers a free add-on tier for you to try out. If you don't have a Cloudinary account yet, sign up for a free account.